Regent Entertainment - 96 min. Cast: Lynda Carter, Parker Stevenson, Emily Barclay, Antony Starr, William Davis, Peter Elliott. Screenplay: Dale G. Bradley ; Director of Photography: Renaud Maire; Visual Effects Supervisor: Peter McCully; Music: Bruce Lynch; Editing: Nicola Smith; Special Effects: Darryl Richards; Production Design: Nigel Evans; Producer: L. Grant Bradley, Jozsef Fityus; Director: Dale G. Bradley. OK, so this might be a "B" movie. A Saturday matinee disaster film. The script and acting was better with 'Dante's Peak', but the special effects here are quite good and New Zealand humor abounds (Dante's Peak took itself too serious). The science is somewhat more respectful than the earlier title. 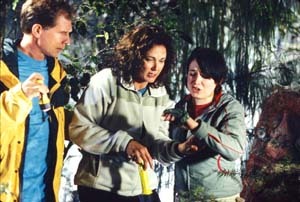 The big winner is that it was filmed in New Zealand (Auckland and the Waitakere Ranges) with excellent photography and it was made for far less money. New Zealand continues to put out low budget and gradually better quality movies that will help keep New Zealand film crews and actors busy. This is one such film that is worth a viewing, so long as you are willing to laugh, while riding along and through some great scenery. R0 NTSC DVDs are available from various Aust or NZ sources for about $15au, $20nz, or US sources for about $10us. There seems to also be an R0 PAL version available from UK sources for about 10#. There is a French language version R0 NTSC DVD available from Canadian sources for about $15ca. There also is a Japanese version, but I have no confirmed pricing or specs yet. The ntsc R0 disc is presented 1.76:1 with a 2.0 dolby digital stereo English soundtrack and no subtitles. The disc does include a 11:33 minute on-set interview with Lynda Carter as an Easter Egg. I have read one report that there is a German language only version, with no English track, that is presented 1.33:1. No soundtrack CD of this title.